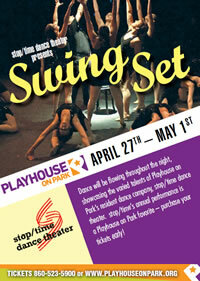 Playhouse on Park is proud to present stop/time dance theater in a new production, titled "SWING SET." The company will surprise you with their take on the swing era which will have a mix of traditional swing, tap and even hip hop. Stop/Time's annual dance performance is a favorite at Playhouse on Park. Buy your tickets early! "Swing Set" is conceived and directed by Darlene Zoller.